A high school student creates a work of art on asphalt during USAO’s annual Montmartre Chalk Art Festival in April. 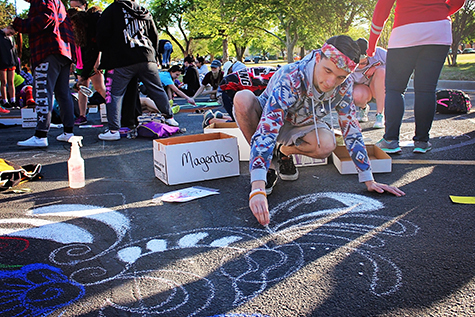 Artists from elementary schools, high schools and colleges across Oklahoma created 336 sidewalk chalk art murals throughout the morning on the road leading through the USAO oval. Participating students represented 61 Oklahoma schools and colleges. The University of Central Oklahoma’s Operation Degree Completion has been named a Spring 2016 Model of Excellence by University Business magazine. 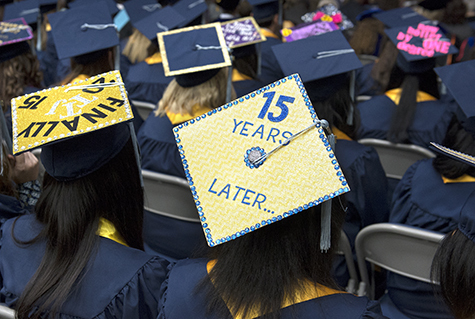 The UCO program has led to the completion of nearly 3,600 bachelor’s and associate’s degrees since its inception in 2009. 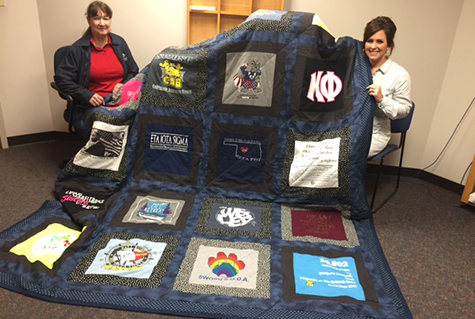 Rita Hays (left) won this quilt that was comprised of shirts from various Southwestern Oklahoma State University clubs and organizations on the Weatherford campus. SWOSU’s Collegiate Activities Board sold tickets and candy for a drawing to win the quilt with proceeds benefiting the American Cancer Society’s Relay for Life event.CAB raised $884. With Hays is Jordan Selman, director of student activities at SWOSU.